Over the past five years, Snapchat has established itself as one of the most influential social media platforms. This past June, Bloomberg Markets reported that Snapchat has 150 million people using the app each day; making the app more popular than Twitter in terms of daily usage. Snapchat started off as a messaging app where user shared pictures would be trashed after 1- 10 seconds. Since that time, the platform has evolved to include chat, video, face filters, and many other fun ways to communicate. The app has also included 24-hour stories for events and specific brands to interact with users and promote content. With such a massive potential for exposure, various organizations are jumping on the chance to use this unique platform to reach new consumers. Unlike Facebook and Twitter, Snapchat promotes a sense of casual communication between individuals. The environment is a platform where the user can get creative when sharing personal experiences. If you are unacquainted with the app, take time to read about how some big brands have created a successful app following, including Taco Bell, Acura, DJ Khaled and the NFL. 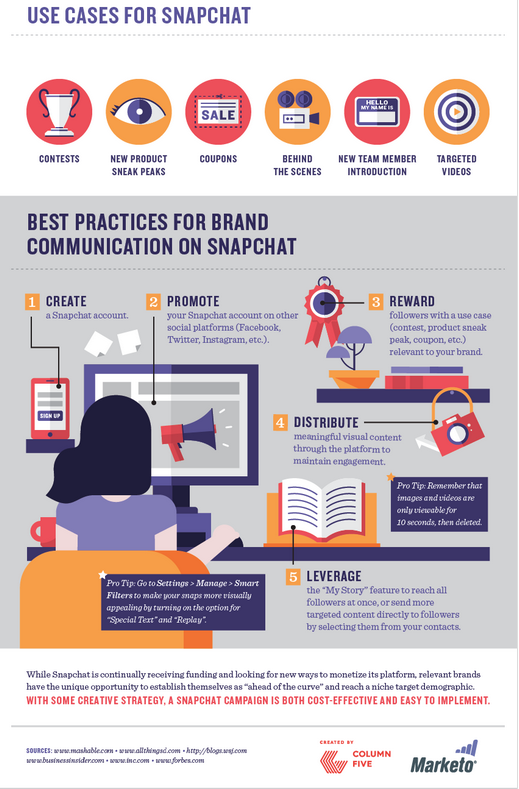 Snapchats are limited in time so whether sharing a video or photo, it is important to approach your posts with a strategy to maximize effectiveness. 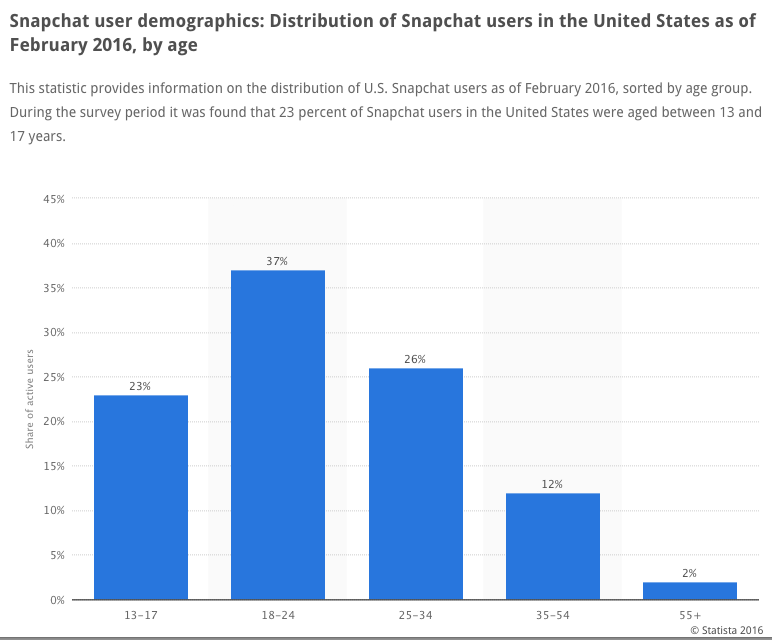 In the United States, 60% of Snapchat users are between the ages of 13 to 24. Being engaged on the app is an exceptional method for reaching out to younger demographics so try to use the features that are available to send your message: draw pictures, use easy to read text, try out the face lenses. Since the platform has established an informal atmosphere, it is easier to be more personable with your audience. Snapchat can be used for more of a behind the scenes look at your team or company. Try out some filters and post some content to figure out what works and what doesn’t. Use posts to convey your brand’s personality to the viewer. Connecting through experiences that will resonnate with the user is key. People are always going to be interested in the day to day life of others if it’s relevant to them. Use the app to give Snapchatters an exclusive sneak peek at new products, events, or promotions. While not everyone will be interested in ads all the time, it is important to balance your content and produce quality stories that captures and entertain your viewers. It is also important to connect on a personal level to potential consumers so Q + As or giveaways might be something to try. If you want to connect with Snapchatters on an even larger scale, you can produce an ad that everyone can see, whether they actively follow you or not. According to eMarketer.com, 22% of senior ad buyers planned to use Snapchat to advertise for the first time in 2016. Snapchat has partnered with many brands to produce high quality ads that are amusing and entertaining, appealing to many viewers. Strategies include pop up videos, sponsored geofilters, and sponsored lenses. Bloomberg Markets also reports Snapchat now has more than 60 million daily active users in the U.S. and Canada — about a third of what Facebook Inc. has in the world’s most lucrative advertising market. Social media is must for your marketing strategy, however evaluating which platforms make the most sense for your target audience is the first step. Snapchat might not be the first marketing platform that comes to mind, but if relevant to your target audience, can be both strategic and influential when it comes to meeting your business objectives.